This is a delicious cheese pie, with a rich and creamy filling that melts in your mouth. The sweetness of the semolina cream and the spicy taste of the two types of cheese, make a fantastic combination! You can eat it as a snack or you can serve it with your favorite salad and turn it into a main dish. Pour the milk into a small pot, put it on medium heat and wait for a few minutes to warm up. Add semolina and whisk constantly to avoid any lumps. Lower heat and continue whisking. When the mixture starts to thicken, remove it from the heat, add the cold butter and stir until incorporated. Adding the butter cold, helps the mixture to cool faster. Add nutmeg and stir. Place it aside and let it cool completely. Mix feta with kasseri. Beat the eggs and add them to the cheese mixture. Season with pepper and set it aside for the moment. Flour your working surface, take the first piece of dough out of the fridge and start rolling out a round pastry sheet. The baking pan should be 40cm/16″ in diameter, so the bottom pastry sheet has to be a little bigger; it has to cover its sides so that it can hold the filling. Brush your baking pan with olive oil. Wrap the sheet around the rolling pin and transfer it to the baking pan. Arrange it nicely. Add the cooled semolina cream to the cheese mixture and give it a good stir. Spread the filling all over the surface of the baking pan. Roll out the second piece of dough. This time, the sheet should be exactly 40cm/16 inches in diameter, just to cover the filling. Use your rolling pin to transfer the sheet easily. 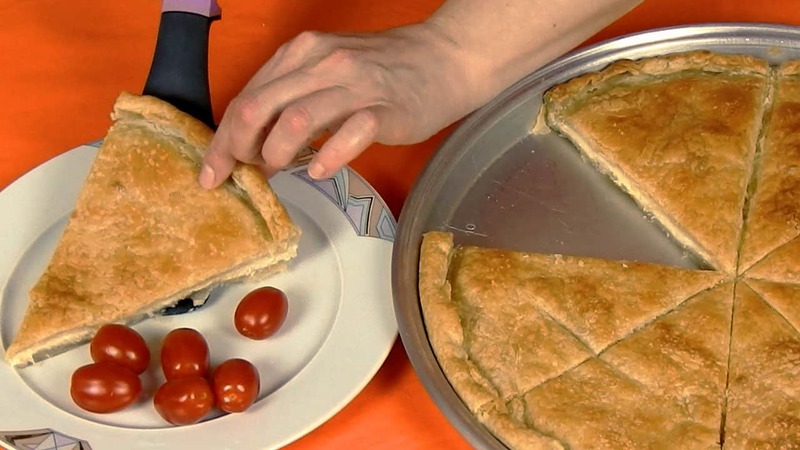 Fold and press the edges with your fingers, to seal and decorate the pie. Brush with olive oil. Take a knife and carefully cut the pie into pieces but not all the way to the bottom! This way, you’re creating vents, to allow the steam to escape. Bake the pie in a 180°C /350°F oven, lowest position, for 45 to 50 min or until it’s golden brown.